A dictionary definition would define identity as the characteristics uniquely determining what makes a thing, whether living or inanimate. Consider what is necessary and sufficient to define an identity. Inanimate things can have identity. The Great Pyramid, or the Empire State building or even that particular, nondescript boulder just there, has an identity. That particular boulder, with that volume and that physical composition and which now is located in my garden in Sweden, may have been formed when it was ejected after a volcanic eruption on Gondwanaland some 500 million years ago. Or it may have been formed 100 years ago when rocks in this region were blasted to build a road. The key point here is that this particular thing had a beginning on the time line of the universe. This beginning, this begin-time, is inextricably tied to the identity of this boulder. This identifiable boulder may have lost some mass by erosion over the years or it may have (though much less likely) grown in mass by accretion. Its mass may have changed over time and its shape and volume may have changed. Even its composition may have changed somewhat as chemical reactions with the surrounding atmosphere slowly occurred. At any given time however, the thing having identity uniquely occupies a physical space. 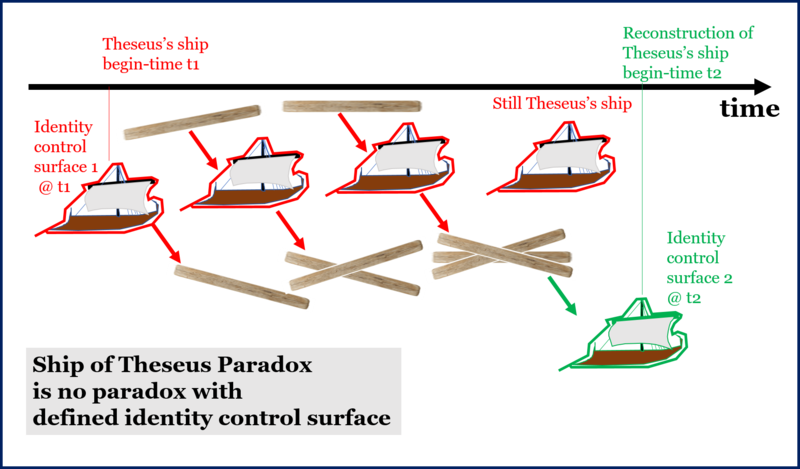 The Ship of Theseus (see Theseus paradox) had an identity. The ship of Theseus, also known as Theseus’s paradox, is a thought experiment that raises the question of whether an object that has had all of its components replaced remains fundamentally the same object. The paradox is most notably recorded by Plutarch in Life of Theseus from the late first century. Plutarch asked whether a ship that had been restored by replacing every single wooden part remained the same ship. In an inertial frame of reference, a control volume is a volume fixed in space or moving with constant velocity, through which the fluid (gas, or liquid) flows. The surface enclosing the control volume is referred to as the control surface. Analogous to a control surface, I define an identity control surface. It is abstract (no mass, no thickness, no volume, no energy) but it is definable in 3-dimensional physical space at any instant of time. Unlike in fluid dynamics, this control surface does not enclose a fixed control volume, but physically encloses that which has identity. Whenever that boulder was formed, it was physically enclosed within an elastic identity control surface. The identity control surface is dynamic, elastic and permeable. It is not however fixed in space along the time axis. Its permeability allows the flow of material in both directions, but the integrity of the identity within is not compromised as long as the flow is small relative to the material enclosed. The elastic identity control surface maintains the identity enclosed as it accommodates gradual growth or a shrinkage of the enclosed physical material. The dynamic ability of the identity control surface maintains the continuity over time of the identity enclosed. An identity control surface may be embedded within another identity control surface as would happen if our boulder was used in a building which had its own identity. Both are necessary and are together sufficient to define the identity of an inanimate thing. The Great Pyramid and the Empire State Building comply. Their identities will end when the identity control surface is breached sufficiently to create a death on the time line of the universe. With an identifiable identity control surface and an identified begin-time, Theseus’s ship no longer presents a paradox. As long as the replacements to the ship are small relative to the whole, its identity continues. Even if 100% of the original ship’s timbers are eventually replaced it retains its identity. However another ship gradually built up from the original (discarded) timbers would have a new beginning and a new identity surface and a new identity. Note that each timber as it was discarded would no longer be a part of identity that was Theseus’s Ship. The rebuilt ship would be a reconstruction, albeit with the original materials, of Theseus’s ship but it could never have the identity of Theseus’s ship. There is no ambiguity about identity. It seems to me that these two characteristics would also be necessary and sufficient to define the identity not only of inanimate things but also of all living things including humans. 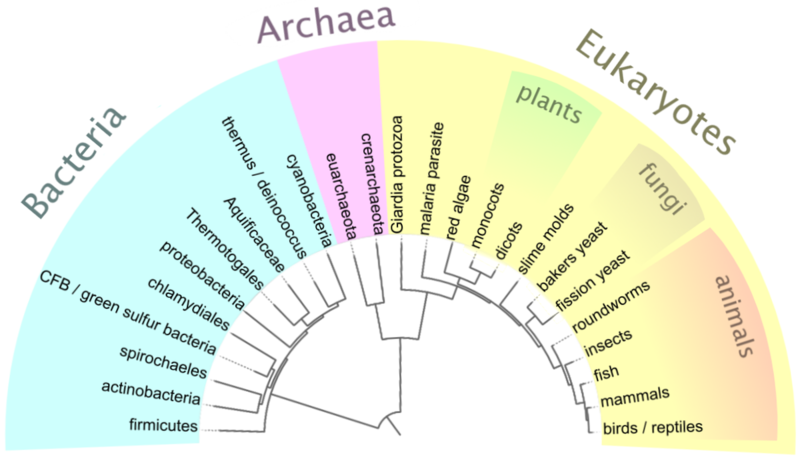 For all living things the identity control surface would come into being when the unique genetic make up of that entity was established. For a tree it would enclose the seed or enclose the fertilised egg for a chicken or for a human. 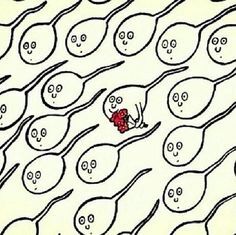 For humans, conception or the point at which a fertilised egg embeds itself in the uterus, would seem to be appropriate as the begin-time of that identity. Initially the newly created fetus identity would be enclosed within the identity control surface of the mother and would separate at birth. As humans grow, the elastic identity control surface expands to accommodate that growth. At any time this control surface can be physically defined. The identity within remains continuous, from its begin-time till that identity control surface ceases to exist (and of course that could be some little time after death). Suppose bodies could be put into cryo-storage. Mr. X’s frozen corpse would retains its identity (as Mr. X’s body), even if Mr. X was long since dead, until decomposition destroyed the identity control surface. There is no contradiction here. The fact of being alive or not is then merely a characteristic of the identity. The brain is not then necessary for an identity to exist. After a brain transplant – if such was possible – the identity continuing would that of the person receiving the brain. Neither is a soul a necessary condition for an identity though that does not say anything about whether a soul exists or not. The identity of each living thing, and that includes the 7 billion humans on the planet, is each uniquely characterised by its identity control surface and its begin-time. This does not address what makes a living thing human, and that would surely involve the brain and whatever one may define as being soul. ….. when an entire individual is cloned; not just their DNA but their memories and experiences, too. If we assume that a person’s memory and experience is just information stored in the human brain (and the rest of the human nervous system) then in theory it should be possible to completely clone an individual with all his or her experiences, habits and memories included, providing we can reconstruct their body and nervous system. The concept of complete human cloning is very much in line with the idea that biological identity consists in virtual information as opposed to material constitution. Since information is virtual, a person can be reconstructed eons after his death and still continue to live his life. The person’s identity becomes a function of all the information stored in his DNA, brain, and the rest of the body. After we have sufficient knowledge of the entire human brain and nervous system, in principle we ought to be able to achieve immortality via this complete human cloning. But this is about creating replicas and not really about identity. You may be able to create an identical, cloned human, but the clone would have a different begin-time and a different identity control surface. A clone might be identical to an original but would have a completely different identity. The clone and the original would have both different begin-times and different identity control surfaces. As identical twins also have completely different identities. Even if their begin-times are identical, they occupy separated physical spaces and different identity control surfaces. So, the reconstruction of Theseus’s ship would give rise to a new identity with a different identity control surface and a different begin-time.